If you are like many businesses that run multiple applications designed with industry specific functions or niche solutions, then it is time to increase productivity by integrating all your systems onto a single, secure, scalable platform with real-time, accurate business information. TopManage Flute Player can optimize and integrate heterogeneous system environments, including SAP software, point-of-sale, payroll, CRMs, ERPs, B2B systems, flat files, XML data and any other third-party application. Flute Player’s enterprise application integration (EAI) enables businesses to integrate data from multiple generations of technology in heterogeneous system environments, enabling businesses to automate business processes, streamline mission-critical operations, and create customized workflow specific to your business. By integrating applications your business can increase efficiency, improve customer service, and reduce cost of ownership for data-centric system architectures. Flute Player’s service-oriented architecture (SOA) delivers high-performance data delivery and transformation among enterprise platforms. It supports high volume, bulk data processing, plus the easy-to-use Web-based interface and flexible framework helps improve productivity and lower development costs. Flute Player automatically integrates your business software systems and ensures that business decisions are made with real-time, accurate data. Make the unthinkable possible. Use Flute Player to create a unified operating platform with a single source of information and help your business grow. Flute Player effectively processes and transforms data according to pre-defined criteria and custom workflow. 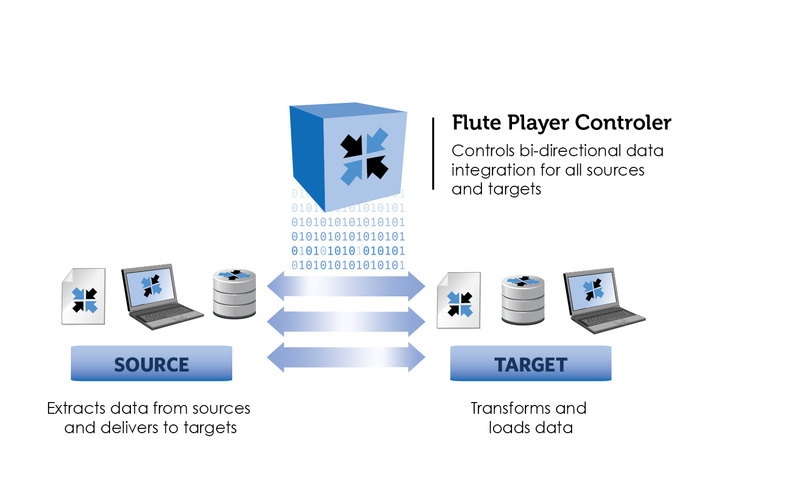 By leveraging relational database management systems, Flute Player is able to extract data from various sources, load the data to a target database, and transform the data at the target location. Flute Player’s ELT functionality enables businesses to streamline operations, increase efficiency and create a scalable platform. By simplifying data integration and transformation, Flute Player greatly reduces implementation time. Furthermore, the user-interface improves visibility and management capability with a detailed dashboard and customizable reports. Flute Player allows the developer to manage and monitor operations, sessions, errors, reports and more. Most businesses position their ERP as the backbone of business operations and the center of transactional information. For this reason, it is critical to integrate the ERP, whether it is SAP or another software provider, with all sources of business information, logic, and functionality so validations and decisions are based on real-time, accurate data. When systems are not integrated, or instead claim to be, but are rather synchronized, duplicate information is created leading to inefficiencies and errors. Flute Player produces real-time ERP system integration and ensures there is no data duplication by providing a single source of information on one database. As each business’s needs are different, Flute Player is designed to be extremely flexible and can be tailored to your specific businesses needs. For example, Flute Player is even able to integrate your ERP with your partner’s or vendor’s system, to allow a seamless transfer of data between both systems. Learn more about SAP Business One integration.